Reporters Without Borders consistently ranks Mexico among the most dangerous places for journalists and netizens. Every year, reporters and citizen journalists are killed in Mexico by criminal cartels for trying to publish their stories. There is a visible need for more secure methods, allowing journalists to do their work without fear of retaliation. This situation inspired FreedomHack, a 24-hour hackathon which ran last weekend (Aug 10 to 11, 2013), bringing together a group of hackers in Washington DC. They brainstormed and programmed through Saturday, presenting their projects to a panel of technology professionals and media activists on Sunday. FreedomHack's goal was to expand existing open-source products that could help to address this situation, and to come up with new ideas for the future – with winning projects to be taken to Mexico for testing. One of the main goals for the weekend was to push forward Amnesty International's mobile alert system Panic Button, an application masked as a calculator that helps activists to communicate permanently with a trusted person. It can both be used areas where there is no internet signal, and allows for the creation of a secure network of NGOs that could react immediately in case of threat (You can read more about Panic Button on the blogs at CommunityRED and Livewire from Amnesty). 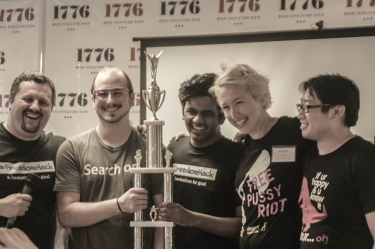 Shauna Dillavou, the Executive Director of CommunityRED and the organiser of FreedomHack, reflected that the organizers had expected to spend the weekend redeveloping open source projects. What they weren't expecting was three new products that were both simple and innovative, potentially going beyond the Mexican context. The key point for the winning app, “Port Key“, was its ability to make something useful with just a few lines of code. This app uses NFC tags, short for “Near Field Communication”. An NFC tag looks like a sticker, and is able to communicate information to a smartphone through a field of radio frequency only a few inches wide, accessible by, for example, setting the phone down on top of the tag. PortKey adapts the NFC tag to the situation on the ground in Mexico, where secure information sharing can be difficult. It keeps this data looking normal, hiding in plain sight. For example, the free speech organisation Article 19 has built an app for journalists that can help them to network safely with each other. Built for security purposes, getting into the app itself requires specific credentials, often passed out in person to avoid potential email security complications. With Port Key, if the log-in credentials are placed on a generic-looking NFC sticker on a bodega countertop or in a public bathroom in Mexico city… it has the potential to give access secretly. Other ideas which were developed were Northur, an “underground railroad” for a network of safehouses, and VozLocal, a buffer app to anonymously report details of threatening situations to Twitter through text, email and voice messaging. You can see the rest of the ideas on the project website. The projects developed were formulated directly with people on the ground in Mexico (human rights defenders, journalists, etc), working with Amnesty and their hub in Mexico City, coordinating through local NGOs. It was a challenge, said Shauna, to get people involved in a pilot project, especially with a group that – out of necessity – is not used to trusting strangers. The next step is to build out these projects, along with Open Technology Institute, for trial in Mexico and to gather feedback. There are plans for another hackathon in Mexico City in November to adapt and move forward with the apps. You can read more about FreedomHack in Spanish on SinEmbargo, follow them on twitter @thefreedomhack and via #FreedomHack, or see what Fox News has to say about them.